About the Evening Public Talk. 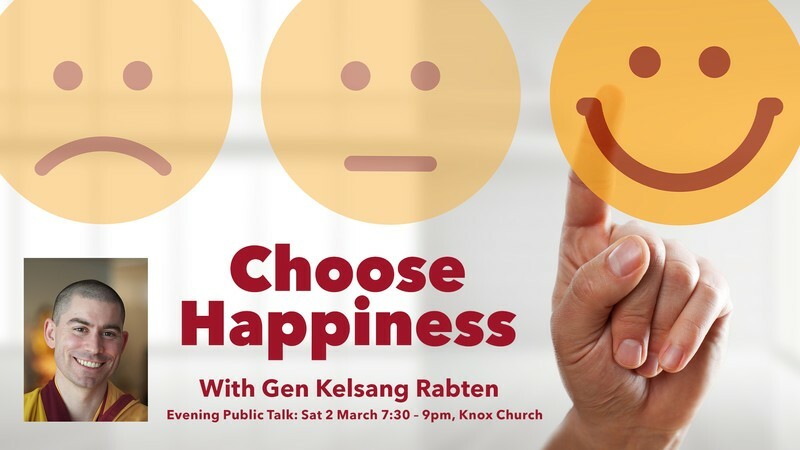 Join internationally-renowned teacher and Buddhist monk, Gen Kelsang Rabten for a life-changing public talk on happiness. Gen Rabten is well loved for his sincerity, humour and inspirational teachings that easily touch our hearts. Each and every one of us is able to tap in to an endless supply of inner peace and happiness. Modern Buddhism presents the meditation and positive thinking techniques we need to achieve this. At this event, open to everyone, Gen Kelsang Rabten will explain the methods that free us from negative attitudes, by looking for happiness where it can be found – within our own mind. Choose happiness. Everybody is welcome to join this special event. This talk is going to be a great introduction for those who are new to Buddhist teachings and will give you the tools and insights you need to choose happiness everyday. Gen Kelsang Rabten is the National Spiritual Director for Kadampa Buddhism in Australia, New Zealand, and South East Asia. He is presently the Resident Teacher of Kadampa Meditation Centre Brisbane. Gen Rabten has trained under the guidance of Venerable Geshe Kelsang Gyatso for over twenty-five years. His deep faith in Buddha’s teachings, and the sincerity of his practice inspire many people to embark on a meaningful and rich spiritual life. This is a rare opportunity to hear him speak, so please book early as this will be a popular event. Cost: Unwaged $12 or $20 cash at the door, no eftpos. Includes refreshments. Contact the Centre to book your place. Or simply buy your ticket at the door.